The Outstanding Building of the Year (TOBY) Award is the most prestigious and comprehensive program in the commercial real estate industry. 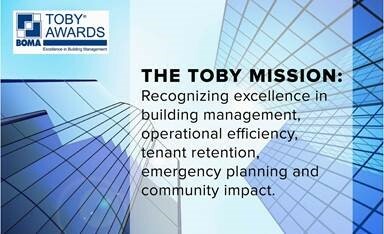 The TOBY recognizes rewards excellence in building management. Established by the Building Owners and Managers Association (BOMA) International, The Outstanding Building of the Year (TOBY) Awards were developed in 1985 to honor and recognize the quality in office building operations and award excellence in office building management. During the competition, all facets of a building's operations are thoroughly evaluated. Buildings are judged on everything from community involvement and site management to environmental policies and procedures. The Bay Area TOBY Awards bring together members of BOMA San Francisco and BOMA Oakland/East Bay to celebrate our great properties here in Northern California. After a win at the local level, buildings move on to the Pacific Southwest Region to compete against other buildings for the honor of competing at the International level. Click here for TOBY FAQ. Click here for the 2019 TOBY Requirements. Need a Coaching Session? Sometimes, the best way to work through the process is to talk to someone who can offer guidance and answer questions. BOMA Oakland and BOMA SF have these resources available. For BOMA Oakland properties, please contact Kelly Jauregui, kelly.jauregui@cushwake.com and for SF properties, please contact Glenn Good, ggood@tishmanspeyer.com. This year's competition is being managed by BOMA Oakland/East Bay. BOMA SF members should contact BOMA Oakland/East Bay's Noelle, admin@bomaoeb.org, for assistance. Registration closes on October 31, 2018.